Investors seem underwhelmed by management's plans to restructure. Are they wrong? 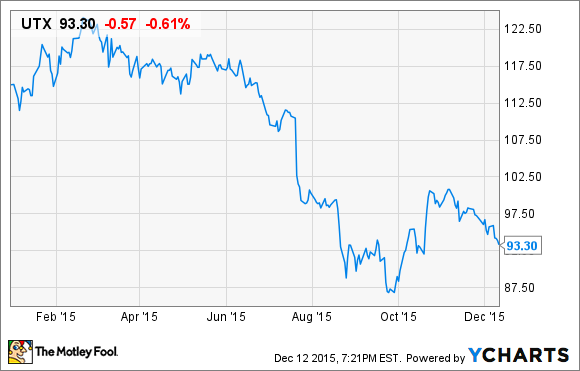 United Technologies shares have gone mainly in one direction (and the wrong one) all year long. UTX data by YCharts. On Thursday, United Technologies (NYSE:UTX) held a meeting with investors and stock analysts, at which the company raised its guidance on profits for the year. Management went on to promise growing profits in the new year, significant cost cuts to continue expanding profitability -- and a big stock buyback, to concentrate profits among shareholders who stick around while the company gets its financial house in order. With the year more than 90% over, management's view of how profits will shape up this year should be pretty complete by now. It's encouraging that the company raised the floor on profits guidance by a nickel, to $6.20, but United Tech declined to raise the high end on guidance at all. The most we can hope for this year, it seems, is still $6.30 per share. At last report, United Technologies was hoping to record $57 billion to $58 billion in revenues by year end. Although management raised guidance for profits, it said nothing new on revenues. It seems no improvement in those numbers can be expected this year. United Technologies' sale of Sikorsky to Lockheed Martin (NYSE:LMT) this past summer is working out swimmingly -- for Lockheed Martin. Already this year, Sikorsky has announced helicopter contract wins in Saudi Arabia, Jordan, and Mexico, all of which promise to benefit new owner Lockheed Martin. But the loss of a business that generated $7.45 billion for United Technologies last year (according to data from S&P Capital IQ) is going to hit the seller hard. United Tech is moving quickly to redeploy the $9 billion collected from its Sikorsky sale, however. Some cash may be used to invest in new businesses. The vast majority, $6 billion, will be plowed into stock repurchases that could reduce United Tech's share count by as much as 7%, concentrating companywide net profits among fewer shares, and boosting earnings per share. After a year that has seen United Technologies stock lose 20% of its value, investors may be beginning to lose patience with this conglomerate. But if you ask me, that would be a mistake. While I still don't agree with the decision to let Sikorsky go, CEO Gregory Hayes is at least making the right moves to redeploy his Sikorsky profits to the benefit of shareholders.